(TNS)—Winter is still a few months away, but it’s not too early to start thinking about cutting cold-weather energy costs. Taking some time to weatherproof your home and maintain or upgrade appliances can result in significant savings when the snow starts falling. And making a few small lifestyle changes can help both the environment and your bank balance. 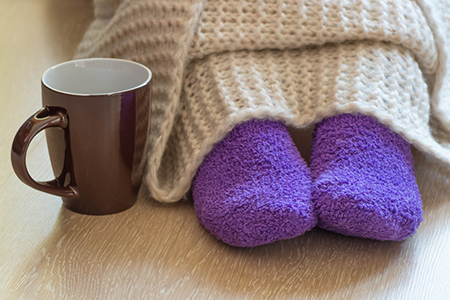 Consider these tips to help slash your energy bills this winter — or even year round. Don’t shed that sweater when you get home. Instead, wear warm clothing inside and turn your thermostat down. You can save 5 percent on heating costs for every degree you drop your thermostat in the 60-70 degree range, according to the California Energy Commission’s Consumer Energy Center, which suggests a maximum setting of 68 degrees during the day. Unless you have a heat pump, consider cranking the thermostat setting down to 55 degrees when you’re sleeping or away from home for an extended period. This small sacrifice can slash 5 percent to 20 percent from your heating bill. And if you want to take the strategy to the next level, turn the temperature on your water heater down to 120 degrees, which is safe and sanitary for most households, according to the U.S. Department of Energy. Smart home systems can adjust the thermostat for you — and cut your residential energy costs. The Nest thermostat, for example, automatically adjusts the temperature after users set it manually for the first few days to establish usage patterns and preferences. It can also adjust according to factors such as draftiness or how long a home takes to get warm. According to the Nest site, two independent studies analyzing energy bills before and after homeowners installed Nest’s thermostat showed that it cut cooling costs by 15 percent and reduced heating usage by 10 percent to 12 percent. Consumers enjoyed average savings of $131 to $145 a year. The Nest Learning Thermostat sells for $249, but some energy companies offer rebates or even send plan participants small thermostat models free of charge. Replacing old appliances can cut energy bills across the board. In fact, 20 percent of our electricity bill’s balance comes from running appliances, according to This Old House. However, opting for Energy Star-qualified dishwashers, washing machines and refrigerators can dramatically reduce that percentage. For example, Energy Star refrigerators use 50 percent less energy than those manufactured 15 years ago and 15 percent less than fridges without the efficiency rating. Moreover, Energy Star washers are 40 percent more efficient than their conventional counterparts lacking the Energy Star label. Considering water heating costs account for 11 percent of your utility bills, switching out your water heater can drastically cut energy bills, according to This Old House. Consider gas and solar options, many of which are tankless to maximize efficiency. Additionally, homeowners should assess the condition of their furnaces. The average life expectancy for a gas or oil-fired furnace is 15 years to 20 years, according to This Old House, and an aging, inefficient model could be inflating your energy bill. On the other hand, an Energy Star-certified furnace is at least 15 percent more efficient than a standard model and can save you up to 20 percent on heating costs. Although replacing major appliances can be expensive, doing so will probably pay off if you plan to stay put for several years. Additionally, replacing HVAC equipment can qualify you for a tax discount. There are many ways to keep out the cold, including insulating windows with clear plastic sheeting and installing insulated window coverings, according to the U.S. Department of Energy, which offers tips on detecting and sealing air leaks. Detect drafts around chimneys, in unfinished spaces behind cabinets and closets, and in other areas and seal them. Additionally, lose your fireplace’s damper when it’s not in use, and apply weatherstripping or caulk around drafty doors and windows to stop cold air in its tracks. Shane Kenny, founder of the subscription air filter company FilterSnap, recommends using the beginning of the year as a time to take care of many routine home maintenance tasks, such as changing the batteries in smoke and carbon monoxide detectors, vacuuming the refrigerator coils and checking its seals to improve efficiency and changing refrigerator water filters and furnace air filters. Regularly changing filters can be a big energy saver and improve air quality in your home. “Keep your HVAC, home and yourself happy this year and change your filter every three months, at least,” he says. Arrange for an HVAC professional to give your furnace a once-over before the cold kicks in, says Murphy. Even apartment dwellers can cut their average energy bills by turning off and unplugging unused electronics and small appliances. According to EPA estimates, idle gadgets waste more than 100 billion kilowatt hours of electricity annually — costing consumers $10 billion a year. Department. And savings-savvy homeowners can even upgrade their holiday lights. “LED string lights consume much less energy than standard lights, and switching to LED lights can produce serious savings if you tend to keep your lights plugged in for hours at a time,” says Caiello. For example, the estimated cost of electricity to light a 6-foot tree for 12 hours a day for 40 days is $10 with incandescent C-9 lights, compared to just 27 cents with LED lights of the same size.